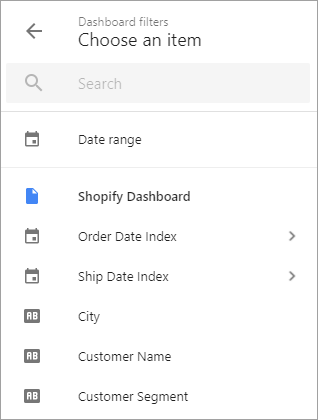 When your dashboard is ready, you can add filters that can be applied to the entire sheet, dashboard, or a set of selected charts. These filters are available in both the edit and view mode. If you give your team access to the dashboard, they will also be able to use filters, no matter what rights they have (editors or viewers). This is how your users can run their own analysis without editing the dashboard. To add a filter to a dashboard, from the dashboard editing view, click the Add filter icon at the top right corner. In the filter pane, containing all the categories (dimensions), select the dimension to add it as a dashboard filter. You can add as many dimensions as filters as you want. You can also select the Date Range option – it adds the date control which allows to select a date period for the displaying information. When adding a Date Range filter, first select specific charts, which will be affected by the filter. For each chart, select a date dimension (or several dimensions, but not more than 3). Click DONE. You can then edit the charts and chart dimensions, affected by the filter, in the Settings > Actions menu of the filter. When building a filter based on date-type dimension, first select specific charts and their date dimensions that you need to apply the filter to. Then, set the filter. When building a filter based on srting- and geo-type dimensions, you’ll miss the step to choose specific charts and will be able to set the filter first. By default, controls affect the charts that belong to a selected sheet. When the filter is created, it appears in the Dashboard filters pane. You can easily manage filter settings or delete a filter. CLEAR ALL. Click CLEAR ALL button at the top of the Dashboard filters pane to reset filters settings. All the dashboard filters will be removed from charts, but still exist in the list of dashboard filters as empty filters. Clear a specific filter. 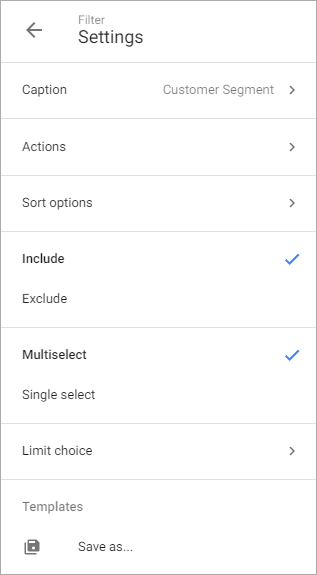 Open a filter and click button to reset filter settings. The filter will still be existed in the list of dashboard filters, but removed from charts. X button. Click X button on the control to delete it from the Dashboard filters. Please note that the filter is just deleted from the list of Dashboard filters, but still exists in the charts. You can manage filter settings. Click the control on the Filters panel and open the Settings menu (the gear wheel at the top right corner). You’ll then see the Settings window to begin customizing controls. Caption. You can rename the control. Actions. Decide if the control should be applied to the entire dashboard, current sheet or selected charts. By default, all the filters are set for the current sheet of the dashboard. Useful tip: to see the full list of the charts of the whole dashboard, select “Entire dashboard” and then click “Specific charts”. To see the list of the charts of the current sheet, select “Current sheet” and then select “Specific charts”. Decide whether to Include or Exclude the selected elements from the chart data. 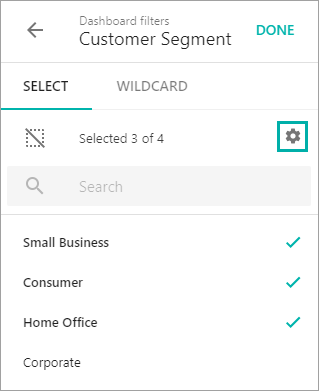 Select whether this filter will be Multiselect or Single select. Templates. Save the filter selection for the future use. Sometimes you can have dimensions with more elements than are necessary and this can make the effective use of controls difficult. To remedy this, you can remove individual elements from showing up when the viewer uses the control. To do this, open the control on the Filters panel and select Settings > Limit choice. A dialog window will appear allowing you exclude options that the viewer will see when using the control. Select. 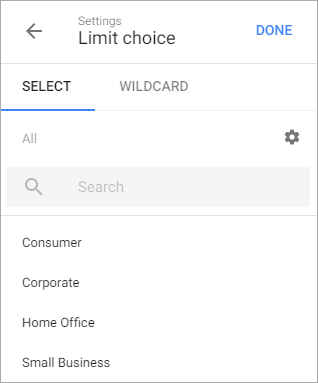 All the selected items are set as Include by default. Click gear wheel icon to get into the Settings and change it from Include to Exclude if needed. Wildcard. You can include or exclude from a filter list all the values, which Contains / Start with / End with / Exactly match a specific sub-string. 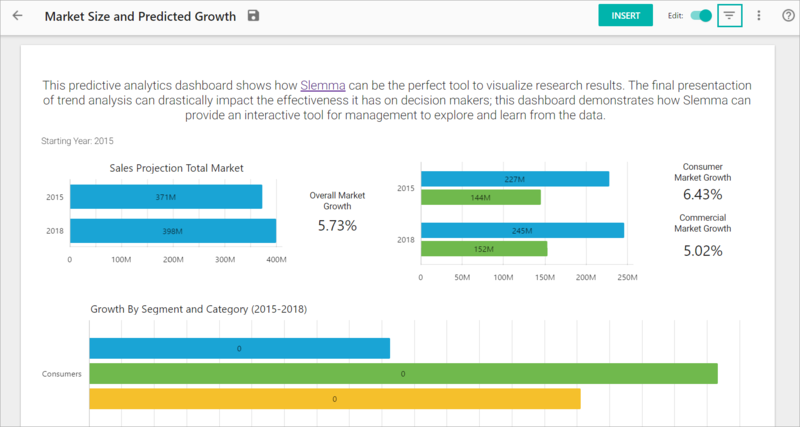 If you have more than one data source used in your dashboard, you may need to set the correlation between the dimensions from different sources. You may also need to set the correlation between different dimensions of one source. To make the filter work for all needed dimensions, select the control and choose Settings > Actions > Specific charts. You’ll see the list of the charts added to the dashboard. Click a chart to open the list of its dimensions. Select the dimension that you need to be linked to the chosen one. Specify the filter attribute (name/key) and match type (full match/substring) for the dimension. Click DONE. Select another chart to the linked filter and specify the dimension and match type. The filter will now work for all needed dimensions. If your chart shows the “No data” message after the filter/filters been applied, this means that the chart still works, but you don’t have any data in your data source for the selected filter elements. Try to select another filter combination , date period, or remove a filter. Associative engine is a sort of filtering made even before the filter is applied to a dashboard. It gives you the opportunity to associate filter elements with the actual values in a dataset , and grey out the elements which will result ‘no data’ in the applied charts. These elements will still be available for selection, though. To enable associative engine for all the dashboard filters, from the dashboard editing view, click More (three-dots button at the top right corner) and select Settings. Turn on the Enable associative engine option. If your filter affects several charts, it will grey out only those elements for which you haven’t got any data in all these charts. NOTE: Enabling associative engine can slow down the data loading. To filter your charts, select Filters button in the top right corner of a dashboard. Click the desired filter to open it, update the elements or the date range by which you want to filter and click the APPLY button. Filter control pane will be displayed at the top of the dashboard. Please note that filter selection can be saved in the editing view only. Once you made your selection in the Reading view and close the dashboard, the selection will reset unless you switch to the editing view and save the changes. Dashboard filter appears at the top of the dashboard when one selects some elements in it. But if there no elements selected, the filter doesn’t appear on the page. To display dashboard filters on the top of the dashboard even if there is no selection applied, select, from the Dashboard’s top ribbon, More (three dots icon) > Settings > Display all filters on sheet. Click the Pin icon at the top right corner of the filter pane to fixate the pane at the top of the screen while scrolling the dashboard.